The trip to Milford Sound was amazing, but it was a really full day. So our next day was just a quiet, relaxing day. Kathleen went into town, and I went fishing on the lake. I actually caught a nice rainbow trout. We actually got to chat with the owner and winemaker at Valli winery. 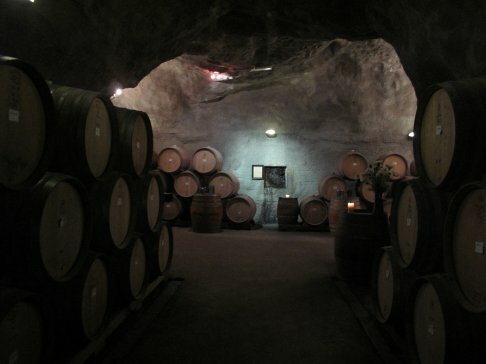 He has vineyards in several different valleys in the area, and he let us taste the Pinot Noir wines made from each valley. Each valley had its own, unique taste. It was quite interesting. 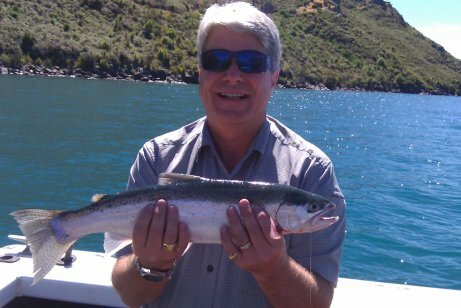 My personal favorite was the one from the Waitaki Valley, because it had a robust taste and a nice, long finish. 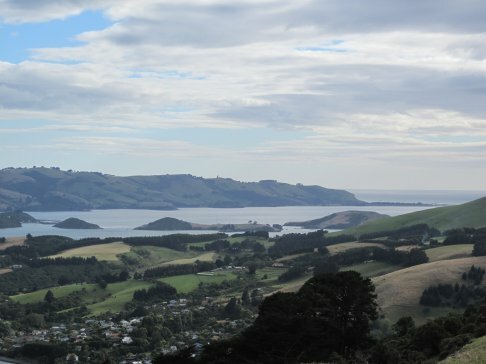 We then went to Dunedin, which was quite a surprise. It was formed by volcanic activity, and the mix of volcanic mountains and the ocean was stunning. 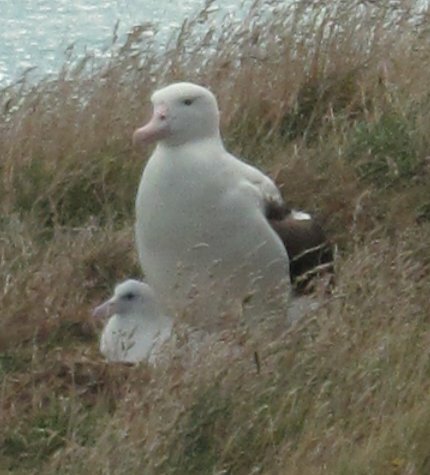 The main reason we went there was to see one of the few albatross colonies that is on inhabited soil. We were there during the time the parents were raising the chicks, and it was precious. Of course, the amazing thing is to see them fly. They spend most of the lives on or above the ocean, and they are well-designed for such a life. They expend little energy flying, as they are adept gliders. They apparently sleep while gliding, because if they were to always sleep while floating on top of the ocean, they would be at risk from predators. While scientists aren’t sure how they do it (or how much of their sleep is done that way), it is assumed that like dolphins, they can “turn off” half their nervous system while the other half stays active. Thus, their bodies probably sleep in sections. 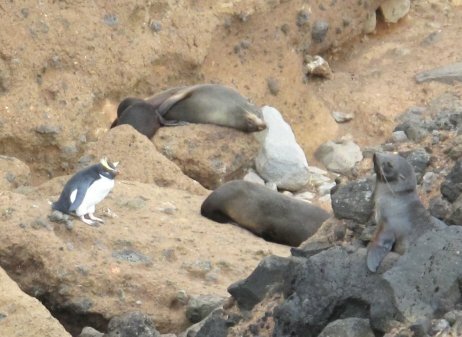 We also went to see the yellow-eyed penguins, which have a colony in that area of the country as well. The young were almost out of their baby feathers, and many of the adults were in the process of molting. We got to get very close to several of them, even though they are wild. We then boarded a boat that took us out into the harbor. 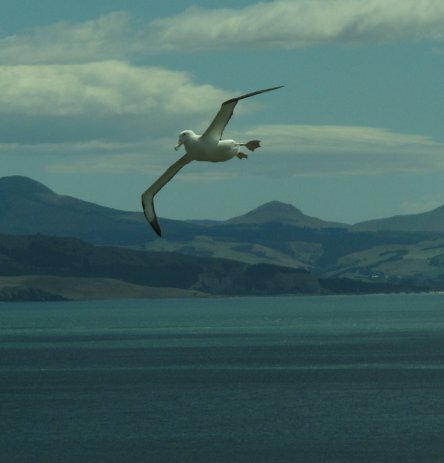 From there, we saw a lot of albatross gliding around, and we also saw New Zealand fur seals. This is a picture of a young pup. There was a lot of wildlife on the shores around the harbor. 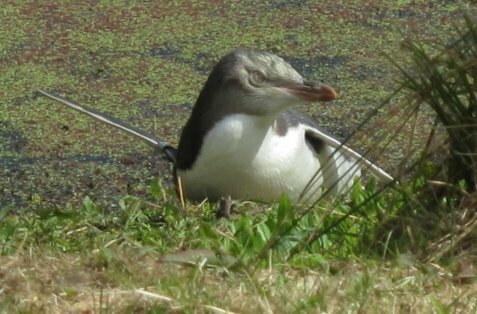 One exciting thing we saw was a Fiordland Crested Penguin, which is rather unusual for the Dunedin area. 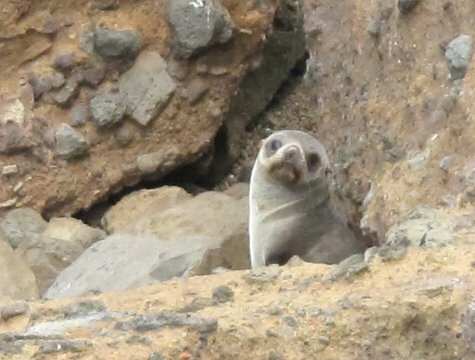 Here he (or she) is among some fur seals. Sadly, we are coming to the end of our stay. We are now in Christchurch, which is our last stop before home. You are one lucky SOB (no disrespect). I would admit I’m not a monkey’s cousin if I could go right now. Anyway, I have a completely old topic comment. Remember when we were talking about HS biology teachers and being coerced into not teaching evolution? If nothing else, you should enjoy it for the all caps words. Here’s another good comment from that thread. I know you get emails from former students thanking you for your YEC textbooks. But you must realize that the sample has a complete selection bias. Only students who remain YECs ever write to you. You have no idea how many students who read your textbooks later rejected either YEC or creationism altogether. First, you seem to think that only YECs use my courses. That’s not true at all. In fact, Sonlight Curriculum is run by an old-earth creationist, and they use my courses for their grades 7-12 science. 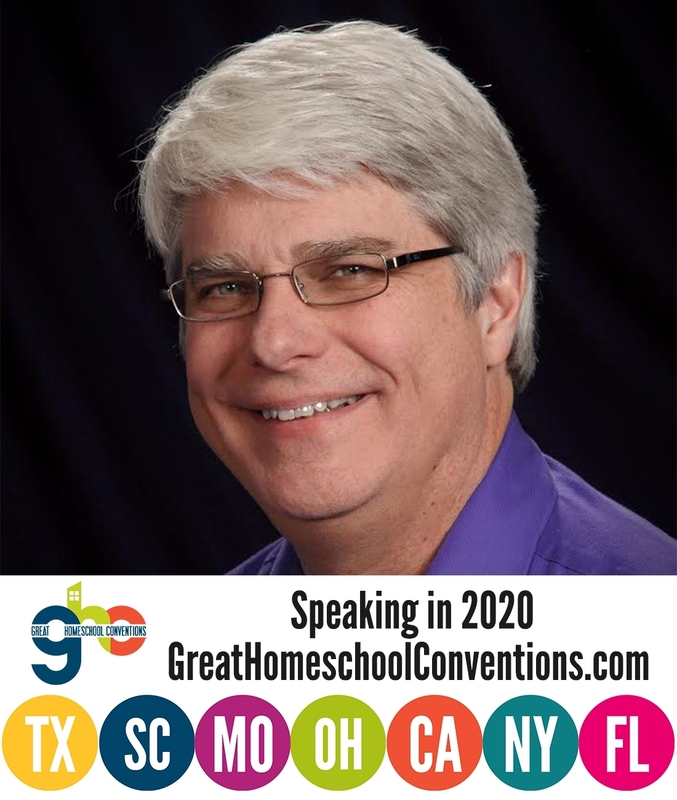 In addition, secular homeschoolers use our courses as well. In fact, one of the students who contacted me when she was using my books had an address that started out ‘satanschick…’ She was a goth, and her parents were atheists. Nevertheless, they used my books because my books are such good preparation for university and are ideally-suited for independent study. I have also talked to people at homeschool conventions who are not creationists. They use my books and just mark out or skip the overtly creationist parts. That always amuses me, as I know Christian homeschoolers who do essentially the same thing to secular books – they skip or mark out the parts of the book with which they disagree. I find it all quite silly, but it happens on BOTH sides. Second, many students who changed their views on origins once they got to university contact me afterward. If they changed from one brand of creationism to another, or even if they left the creationist view altogether, they still thank me for the preparation that my books gave them to be excellent university students. Indeed, I had one student who became a theistic evolutionist tell me that the critical thinking my books instilled in him is what caused him to change from YEC to theistic evolution. Now of course, I agree that any kind of voluntary feedback is self-selecting. Most students wouldn’t think of writing to an author telling him or her how LOUSY a book was. However, the point is that if a YEC science education was an inferior science education, I wouldn’t get so much feedback from OUTSTANDING university students who used my books. Now that I think about it, I ended up speaking to Bethany B. after I got her letter that I quoted on my blog. There was an AP reporter who wanted to interview a homeschooled student who was successful in university science. I contacted her to see whether or not I could give her contact information to the reporter. In any event, during our conversation, she actually told me that she wasn’t really sure where she was on the whole creation/evolution issue. She was still trying to learn enough science to figure all that out. I told her that’s EXACTLY what she should do. Third, there are a LOT of students who start out evolutionist and end up creationist after going to university. Thus, the mind-changing works both ways. This is not surprising at all. University is a time when an enormous number of things in your life change. This causes you to re-examine a lot of the fundamental assumptions you made while you were growing up. It is not surprising that students change their minds on key issues as a result. Indeed, some students go to university professing a religious faith and end up “losing” that faith at university. However, some students go to university professing atheism and end up leaving university with a religious faith. This is the nature of education – it changes fundamental assumptions you have made throughout your life. My job as a science educator is NOT to instill a particular faith in a student. My job as a science educator is to instill knowledge of science, love of science, and critical thinking in a student. I personally think that such things will lead a person to Christianity, but that is not the motivation behind my books. The motivation behind my books is solid scientific education, and given the rousing success stories I get, that has certainly been accomplished. Thanks for the quote from the board. While I disagree with ANYTHING that limits academic freedom, I think what the teacher was required to say is actually good. I don’t agree with the school REQUIRING the teacher to say it, but telling students that they need to learn the reigning scientific dogma of the day regardless of whether or not they believe it is a good thing. After all, had Einstein not thoroughly understood Newtonian mechanics, he would not have been able to demonstrate that it doesn’t apply at the atomic or universal scales. That’s why I teach evolution thoroughly in my books – I just teach it thoroughly enough to show how the data don’t support it.